The mixed battery life results and glossy 4K UHD touchscreen on the high-end ThinkPad X1 Extreme have us curious about how the less expensive FHD configuration can perform. Will the FHD SKU be any dimmer or grainier than its pricier option? Will it exhibit less ghosting with faster response times? We'll be reviewing the FHD ThinkPad X1 Extreme - as well as its ThinkPad P1 workstation counterpart - throughout the month of October. The Lenovo ThinkPad X1 Extreme is currently available in two CPU options (i5-8400H or i7-8850H) and two display options (1080p "anti-glare" or 4K UHD "anti-reflective" touchscreen). We're currently finishing up our review on the higher-end Core i7 4K HDR configuration with somewhat mixed results in terms of battery life and certain aspects of the display as detailed here. So, what about the lower-end Core i5 SKU with the 1080p display? After considering reader requests, we will indeed be checking out the less costly configuration for any potential performance throttling and display differences between the FHD and 4K UHD configurations. It's likely that the FHD panel will exhibit different response times, black levels, and color reproduction especially if Lenovo is sourcing different panel providers between its two resolution options. It will also be interesting to see if Lenovo's "anti-glare" non-touchscreen FHD panel is any grainier than the "anti-reflective" 4K UHD touchscreen. 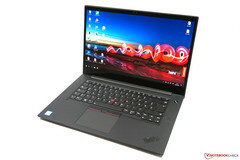 Additionally, we will be reviewing the ThinkPad P1 simultaneously. The ThinkPad P1 shares the same chassis as the ThinkPad X1 Extreme but with altered internal hardware fit for workstation purposes such as its Xeon E-2176M CPU and uncommon Quadro P2000 Max-Q graphics. The model competes directly with the 15.6-inch Dell Precision 5530. If there is a particular aspect of the ThinkPad P1 or FHD ThinkPad X1 Extreme you'd like for us to test, just let us know ahead of time in the comments section below.